At Bedell Cellars, the focus is on letting Long Island wines find their own voice. 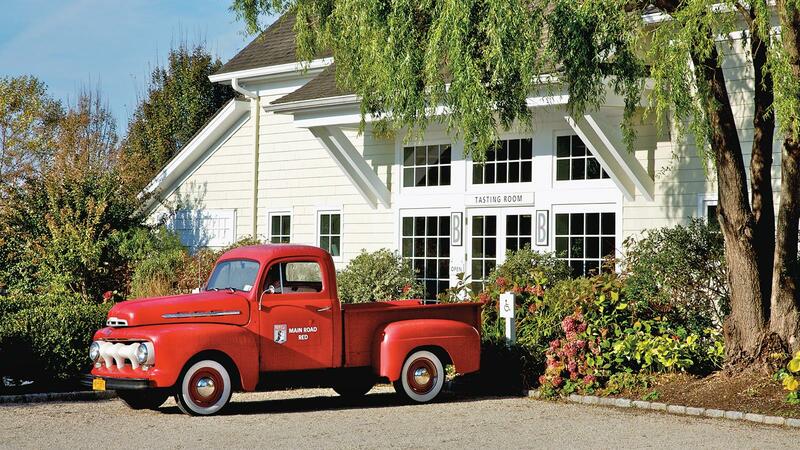 Richard Olsen-Harbich takes a sanguine approach at Long Island's Bedell Cellars. At 55, he's a veteran of the North Fork wine scene, a local who's been making wine here since the 1980s. Like Roman Roth at Wölffer, he's one of the area's most experienced winemakers. But while Roth is looking to push for reds that age, Olsen-Harbisch is a bit more laid-back. "I'm not trying to make a 20-year wine. But I'm not trying to make an immediate-consumption wine either. I want wines that are true to type, true to their site. They'll evolve accordingly from there," he says. "You know, after all this time, what's the point of worrying? Why worry about where the weather is headed in the fall, for example? You can't control it. You can control some of the details in the vineyard or the winery. But some things you can't. I've really taken on a more zen approach over time," he says. Bedell was founded in 1980 by Kip Bedell, one of the region's pioneers. Located in Cutchogue on a slightly undulating piece of equal parts sand, silt and clay known locally as Haven loam; it's warmer here than on the South Fork, and better-suited for reds than whites. Bedell became the most expensive Long Island winery ever sold when movie mogul Michael Lynne bought it in 2000. Lynne then spent another chunk of change adding the Wells Road vineyard. That, combined with the previously acquired Corey Creek winery's holdings, brought Bedell to a hefty 74 acres of vines. As Bedell semi-retired (he's still around, and was walking the vineyard during my visit), John Leavenberg was brought in as winemaker, along with Bordeaux-based consultant Pascal Marty. They were both gone by 2010, and in came Olsen-Harbich, who had been at Raphael, where Paul Pontallier was consulting. "I learned a lot from Paul, who was a good friend," says Olsen-Harbich. "And along the way, I also learned that you have to be your own person. It's like when you're a younger brother, and you dress and act like your older brothers, but it's not really you. And then you grow up. With Paul for example, he came over and said you have to barrel ferment the Sauvignon Blanc. I took plenty of advice from Paul, of course, but I learned to stick to my guns on some things. Sauvignon Blanc out here doesn't need barrel ferment. We did the experiment, and Paul said afterward, 'Yeah, let's not barrel ferment that here.' And that's how I see Long Island developing now. We're learning to be our own person." To that end, Olsen-Harbich is using minimal to no new oak on his reds. "It's a sea change out here, and one that I really like," he says, adding that fresher-styled reds built on acidity rather than tannins are what the area is suited for. "I don't think people realized what the terroir was here when things started. They mapped the California paradigm on to what they were doing right away. There was no history or data on Long Island—we took what we knew from the Finger Lakes or California. And they in turn had taken it from the Old World. And not everything worked," he says. "Over the last 25 years, canopy management has been the biggest change—learning to avoid shade and increase air flow, to maximize the warmth we do get while eliminating humidity pressures. Then, over the last 10 years, it's been tweaking cellar management—controlling those few fine details and dialing in the nuances. That means mainly less extraction and less new oak. I'm of the 'less is more' camp when it comes to winemaking." "I haven't chaptalized in years," says Olsen-Harbich flatly. "Sometimes Chard comes in at only 20 Brix. But now I'm confident if the fruit is good, it will make a good wine. We just had to learn to let local yeasts do the work to see what our local flavors are." But Olsen-Harbich is also quick to point out that he's not just taking a simple hands-off approach. "I like good science and creativity. I'm not going to not use sulphur. I want it as low as possible, all while keeping my year-long efforts in the vineyard and cellar safe." The 2014 Bedell Chardonnay offers bright, unadorned green plum and yellow apple fruit. Also of note is the 2012 Cabernet Franc, which has aged to show off a rounded, loamy edge and a nicely smoldering tobacco note. Along with Merlot, and Malbec, Olsen-Harbich feels there are things that Long Island should start to focus on. "In some ways we're limited by the fact that so many grapes can be grown out here, that we sometimes wind up all over the place. It makes it more difficult to figure out where we're going to hang our hat. But like any region, there are limits to what will work best. For me, Cabernet Franc is clearly one of the best things we can do out here." "In the end, though, I'm not trying to make a Bordeaux-styled Cabernet Franc, or a Loire-styled one. I want to make Long Island Cabernet Franc." You can follow James Molesworth on Twitter, at twitter.com/jmolesworth1, and Instagram, at instagram.com/jmolesworth1.